There are three kinds of maps available. Contact us if you are interested in any of the maps listed below. We are welcome to send you what you need for your trip. 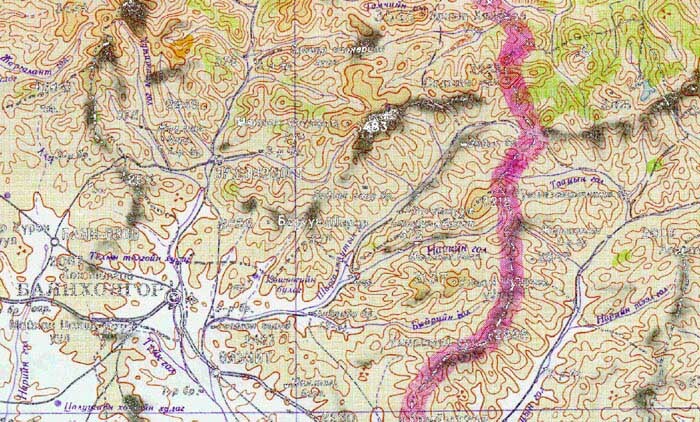 topographic map (1:1.000.000). Really detailed maps ideal for biking, hiking, canoeing, etc. Here is our latest information about various border crossings in Mongolia. There seem to be promising efforts to open up new ones at Lake Hovsgul, in the Altai mountains, or in east Mongolia. Altanbulag, Suhbaataar / Kyachta (Mongolia Selenge Province / Russia), road along the Transmongolian Railway: open to foreigners by road and rail. 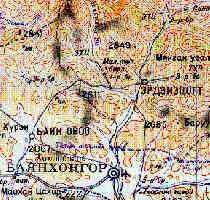 Borshoo, Davts / Khandgavt (Mongolia Uvs Province / Russia): open to foreigners, but requires permission from the Russian authorities. Ereentsav (Mongolia Dornod Province / Russia): seems to be now open for interantional goods traffic (TIR transport agreement). 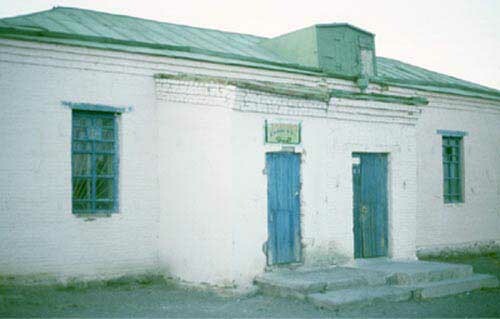 Bulgan (Mongolia/China) border crossing (Khovd Province in Mongolian Altai) will probably be open to foreigners in July/August 2004. Khankh (Mongolia Khovsgol Province / Russia) border crossing (at lake Khovgsol Nuur) will be opened to foreigners probably in early 2005. ZamynUud / Ereen (Mongolia Dornogobi Province / China), along the Transmongolian Railway: open to foreigners. If you plan to use any of the less frequented border crossings, it is highly recommeded to contact Mongolian and Russian or Chinese authorities prior to the trip. In Mongolia, roads (or more precisely: tracks) are not marked with road signs and distances are great. Often enough, one finds two tracks forking and needs a good sense of direction to have an idea which track to follow. Also water can get a problem, especially during fall and in the Gobi desert. We had a capacity to carry 30 liters of water, and thus never had a problem. However, the planning of a tour becomes a lot easier if you know where there are wells and streams. During our tour we took a series of 50 GPS-way points, especially at unmarked intersections and turnoffs, as well as for streams, small lakes and wells. In addition we have quite a collection of other GPS points throughout the country. Contact us for more information. A list of GPS way points is also available at GPS-Navigation Mongolei. For visiting Mongolia you need a visa (if you are from a Western country like Europe, North America, Australia). For stays up to one month, visas can be applied readily. For visas longer than 30 days, you need a visa support from a Mongolian agency. The most convenient way to get a visa support is through a a visa agency (travel agency, or online agencies). Note that visa formalities are a constantly subject to changes. Therefore please confirm the requirements for your country. You should check out the Mongolei Online (it's in German, but has a lot of English links). It contains regularly updated information about visa formalities and a whole lot of other interesting facts about Mongolia. Mongolia is a country with very low population density. In addition, the traditional way of life is a nomadic culture. Traveling Mongolia is a great experience, but it does require quite a degree of "problem solving skills", as not everything is available everywhere. Mountainbike: we recommend steel frame bikes with steel racks. It is more important to have top quality that does not break on the way. There are no bike stores out there! 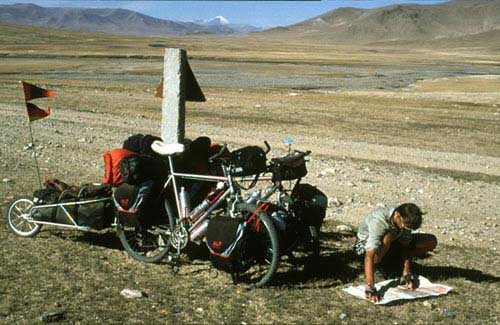 Also bring enough patches and glue for fixing punctures - you will not be able to buy any in Mongolia. As spare parts we carried a tire, two inner tubes, some chain-parts and a rear derailleur. Also, bring all the tools you might need. Locals don't have special bike tools. 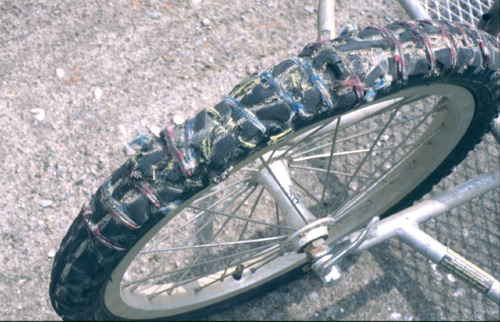 Try to be prepared for the unexpected - we had to repair two broken front racks, and had to mend a tire with string and fix an inner tube with tape. A suspension fork will make riding more comfortable, but then it is important that you have a front rack that is comaptible with the suspension fork (we used one from Faiv). 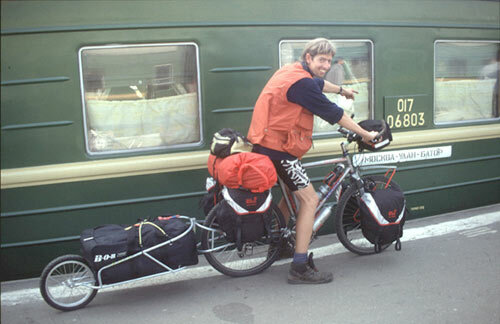 A trailer may be useful if you are planning tours away from the main towns and main tracks. The Rohloff Speedhub is actually the ideal gearing system for a remote place like Mongolia, since it allows immediate gear shifting in all situations, and is essentially maintenance free. Clothing: It can get cold in Mongolia - especially in spring and fall. However, since the climate in Mongolia is very continental, nights are cold, whereas during the day it gets rather hot.We carried thick fleece clothing and polypropylene underwear, as well as shorts for warm weather. If you travel later in the year (August to October) the chances of rain are very low. However, a GoreTex Jacket also serves as good protection against wind. Camping gear: if you plan on camping we recommend a tent that is stable in storms. We had several days with strong winds at night. A warm sleeping bag (up to -20°C) is recommended for everyone traveling in September and October. We often had frost at night! Your stove should work with regular fuel - white gas and camping gas is not readily available. Other stuff: bring enough batteries - they are hard to get. A GPS-device is useful, but not essential. For all those traveling on their own, a compass and maybe an altimeter are very useful for navigation. Mongolia is a high-altitude country, so UV protection for eyes and skin is essential. Supermarkets (or at least the Mongolian type) usually have stock foods like rice, western and local noodles, bread, sugar, flour. The stores in large cities like Ulaan Baatar are rather well stocked, you can get almost everything - if you search hard enough. In smaller towns the situation is very variable. If you happen to be in town when there is market, your chances of finding what you need are pretty good. On the markets you can even get vegetables (especially cabbage and tomatos), different kinds of breads, and fresh meat in addition to stock foods. If there's no market, you have to search for the supermarket, which sometimes can be an adventure. You may have to go to different stores, before you eventually find what you need. In one town we spent exactly two hours finding 500 g of noodles (we did not even care if they were western style or local). As cyling tourist you need a lot of food and calories, and don't want to spend days finding your food. Also you need food in a good calories to volume ratio. 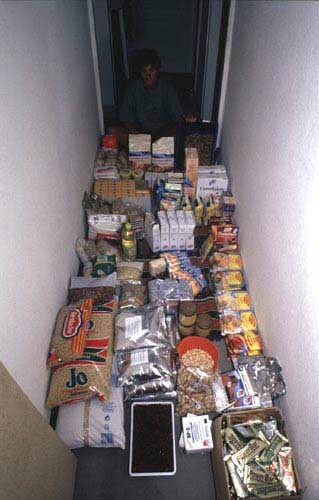 Therefore, we brought all the food for seven weeks with us. This meant an additional 90kg of weight to carry. This weight was distributed among the two bikes and into the one BOB-Yak trailer we used. The additional weight was no big problem. Moreover, we were glad to be absolutely independent of the situation of foo supply in towns, and we had excellent food we designed especially for this tour. We have a list available about the kind of food we prepare. Check it out to be inspired for your own "expedition food". Our diet consisted of self mixed cereal, milk powder, self made pemmican, self made energy bars, power bars, self made marzipan, dried fruit, a self made trail-mix of nuts, sugar, noodles, rice, potato powder, sauce powder, spices (hard to find in Mongolia! ), pudding powder, soybean oil, teabags. We ate about 4000 kcal, which was equivalent to a weight of 800 g of food per person per day. 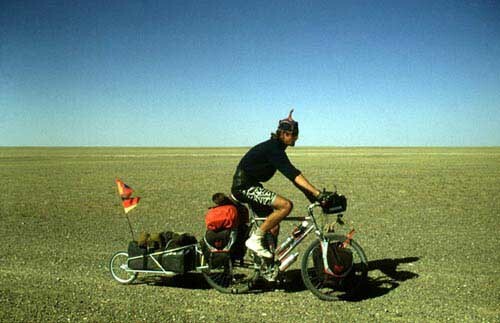 On the bikes we had capacities of carrying 30 L of water in three collapsible containers. Actually, you often will be invited by Mongolians. They are very friendly and will always offer some of their drinks and food to you: Fermented horse milk (airag); a high percentage alcoholic beverage distilled from fermented horse milk (archi); tea with yak milk; dried yoghurt (hard as stone and tastes like one); dried cheese; raw butter; sometimes bread; often mutton meat cooked in fat. Often the meat is served with cooked potatoes or noodles. Spices and salt are not used a lot. Note that Mongolia is the country with highest risk of Brucellosis, which you get from consumption of raw milk products!